What does this mean to you? Everything we print is of the highest color quality and consistency. Our technologies and equipment are put through state of the art calibration methods allowing us to provide you superior color products. 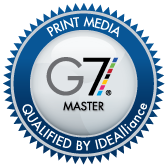 We excel in achieving consistency and color calibration across multiple platforms. We help you achieve a critical component in brand management, consistent and precise color! We give you the piece of mind that all your branded products are consistent and what we print for you today will match what we print for you next month.